Godiva® Rainbow of Treats. A muticolored gift box is filled to the brim with the finest of Godiva®. Who can resist the dark chocolate truffles, milk chocolate truffles, Godiva® heart-shaped signature biscuits, and milk chocolate covered pretzels? This generous gift also includes a Godiva® 72% cacao dark chocolate bar and a 32% cacao milk chocolate bar from Godiva®. 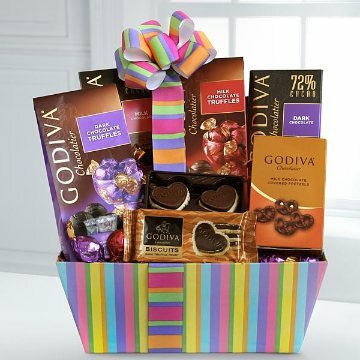 This gift includes: Dark chocolate truffles, milk chocolate truffles, Godiva® heart-shaped signature biscuits, and milk chocolate covered pretzels. Also includes a Godiva® 72% cacao dark chocolate bar and a 32% cacao milk chocolate bar from Godiva®.